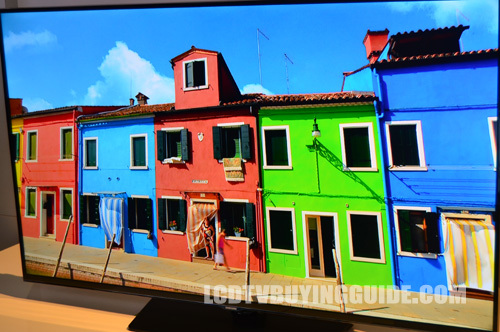 The UN48H5500 sits in the middle of the 5500 series LED TVs for the Samsung 2014 lineup. This value model keeps the excellent Samsung Smart TV platform while foregoing some of the picture quality niceties seen in the 6350 series. The biggest improvemtn to the smart TV platform is the quad core processor to keep things quick and speedy. The full HD display with a Clear Motion Rate of 480 are all you get in the picture quality department. That isn't to say that the resulting picture is bad at all. Samsung's edge-lit LED TVs produce a great picture from front and center viewing angles. The retail price for this one is $749.99. 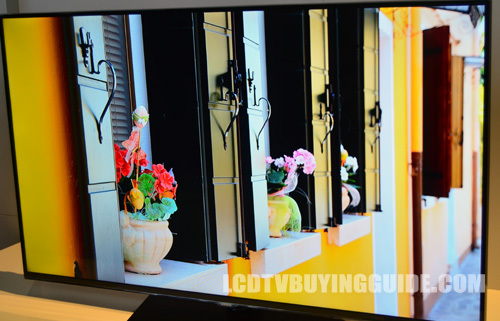 1080p resolution is an important feature for many buying a new TV. A 55 inch screen will really benefit from a full HD screen at the right viewing distances, so it is nice to have. 1080p content from a blu-ray will look fantastic on this display. A lot of TV broadcasts and video games are still 720p, but we are beginning to see more and more 1080p content. Next generation gaming consoles are a big reason for that. 4K broadcasts and content are still a good bit away, so you can be comfortable with this one if you aren't itching to be an early adopter of that tech. A computer or laptop connected through the HDMI input would take advantage of the resolution, giving you more work space on the screen. The 60Hz refresh rate seems a little low, but it surely keeps the cost down on this one. Motion blur and judder are may be a problem on a screen of this size. Those who are looking will see it, but only the most sensitive to the issue will be bothered by it. Side viewing angles on the H5500 perform just as you would expect them to on a low end model. We see contrast and color begin to face at about the 30 degree mark. This is typical for LCD/LED TVs and this one is not plagued by terrible viewing angles. The rehashed Smart Hub platform on the Samsung 2014 lineup is included on the UN48H5500. What's new? Mainly the interface. It has received an upgrade reminiscent of the tiled interface found on tablets and smartphones use. Navigation is the main focus. It is an intuitive upgrade that really makes the whole experience a better one. The H5500 series has been given the quad core processor of the series above it, making it just as fast as some of the best TVs on the market. It also incorporates a slew of recommendation features to help viewers find content they wouldn't find by channel surfing. Samsung has added a new Games page in the Smart Hub as well. Samsung has realized that more power under the hood isn't a bad thing. The H5500 doesn't even have the 4x split screen seen on the higher models. A quad core processor means that TV bootup time, app loading, and app performance are much speedier than before. A very welcome inclusion. The Samsung U48H5500 has a sleek appearance for a value priced model. The thin bezels give it the look of higher end models. The UN48H5500 may have a pretty plain appearance, but it's okay for a value model like this one. 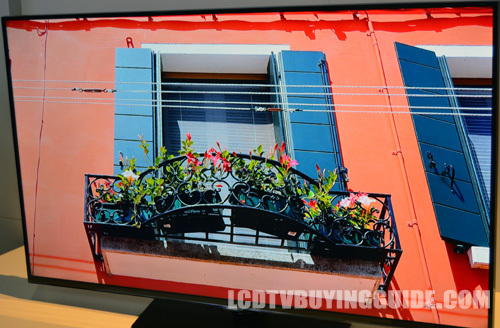 The bezels and profile are very thin to give the TV an updated appearance. The bezels measure in at a mere 0.3 inches. We've seen the black square stand plenty of times before, but it is good for those who don't want anything too flashy. This one is a little different since it slopes down toward the front of the TV. Samsung calls it the Hairline design. It's nice to see the low end TVs making an effort to stand out good. The UN48H5500 is a terrific value for those who are looking for decent picture quality, lots of smart TV options, and a generally pleasing appearance. The feature set is just a little too similar to the H6350 series for less money. The biggest difference being the 120Hz panel. If you can go without that, the H5500 is a clear winner in the less than 50-inch category. 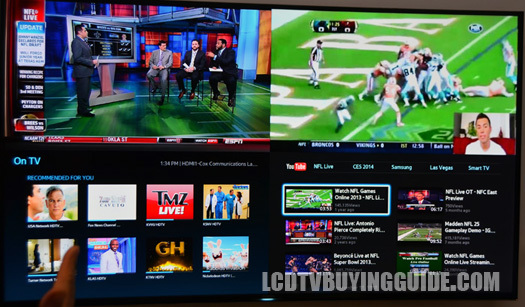 Low end LED TVs from LG and Sony are going to be the biggest competitors with this TV.